The interest-free loan from Bashundhara Foundation can be a role model for eradicating poverty as some 5,861 ultra-poor families of Bancharampur upazila of Brahmanbaria district have already become self-reliant by taking the credits. Earlier, these families who earned their livelihood by working as day-labourers and pulling rickshaws have become solvent after getting the interest-free loan from Bashundhara Foundation. Many of them are now owner of land. Some people have easy bikes, some of the loan recipients said. According to officials, Bashundhara Group, the leading business conglomerate in the country, has been distributing the interest free-loan among the ultra-poor people for long. 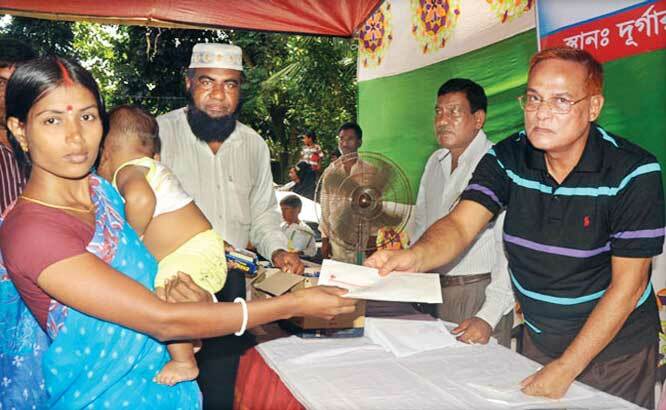 As part of it, a total of Tk 30,40,000 were disbursed among some 334 new members and 137 old members of the loan recipients Tuesday. To distribute the loan, a programme was organised at the head office of Bashundhara Foundation in Durgarampur village under Bancharampur where Adviser (treasurer) of Bashundhara Group Maynal Hossain Chowdhury attended as chief guest. Maynal Hossain Chowdhury said Bashundhara Foundation is giving the loan facility to the inhabitants of 66 villages in Bancharampur upazila. Among others, Bancharampur Sadar union parishad Chairman Hazrat Ali, Paharikandi union parishad Chairman Abdul Gani, Principal of Bancharampur Sobhania Islamia Alim Madrasa Ruhul Amin Abdullah, in-charge of Bashundhara Foundation Mosharraf Hossain and field supervisor Shajahan Miah were present on the occasion. Bashundhara Foundation was established in 2005. Since then, the foundation has been distributing the interest-free loan among the ultra-poor for 33 sectors of their engagement, including poultry and small trades. The most striking features of Bashundhara Foundation loan are that the recipients do not need to bother about paying the loan in first three months. Thereafter, they are to pay the amount in 50 equal installments. They are eligible for next loan after completion of payment of previous one. Besides, this loan is collateral free.